This paper has been getting a lot of attention, and while I think it’s a contribution, I’m skeptical that it’s telling us all that much about the future of Egypt. First, despite the paper’s title, the authors don’t test for post-coup democratization, but rather the likelihood of holding multiparty elections. Around 3/4 of these post-coup elections are within autocracies. Second, the paper only looks at post-coup cases, so can’t tell us about the effect of coups compared to their absence. Recent articles by Varol (2011, HILJ), Thyne & Powell (forthcoming, FPA), and Miller (2012, AJPS) speak more to that. 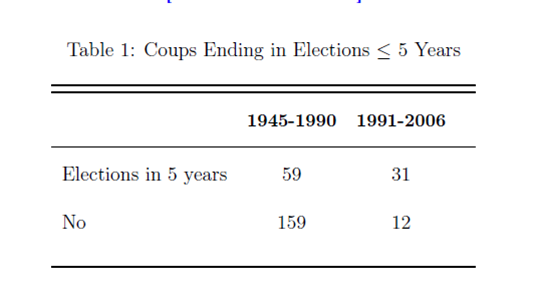 Third, the authors show that post-coup elections are more likely after 1991. However, what they are missing is that this is also true of countries not in the aftermath of coups. This likelihood has also increased and by an identical magnitude. 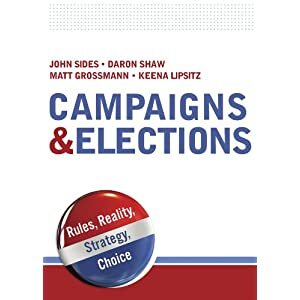 In other words, the post-Cold War shift toward elections has little do with coups.